On 23 November 2012, three concluding plenary sessions of the Inter-Council Presence were held at the Hall of Church Councils of the Cathedral of Christ the Saviour. Before the session, His Holiness Patriarch Kirill of Moscow and All Russia conveyed the words of greetings to His Beatitude Metropolitan Vladimir of Kiev and All Ukraine on the occasion of his seventy-seventh birthday, and congratulated Bishop Irinarkh of Krasnogorsk, chairman of the Synodal Department for Ministry in Prisons, on his sixty-first birthday. “His Beatitude Metropolitan Vladimir is not in Moscow with us today, but his health is getting better, and we wish him God’s help in his pastoral care for the Ukrainian Orthodox Church”, His Holiness Patriarch Kirill said. It was resolved to change the title of the latter document to “On the Russian Orthodox Church’s Participation in Rehabilitation of Drug Addicts” and to submit it to the Holy Synod for approval. 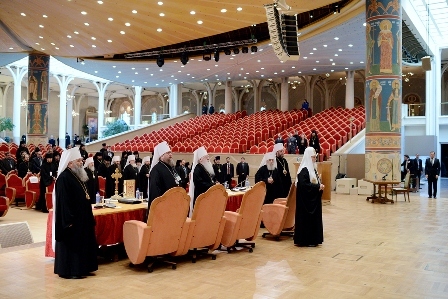 The participants in the plenary made important amendments to the documents “The Basic Ecological Concept of the Russian Orthodox Church” and “On the Church’s Stand with regard to New Technologies for the Identification of a Person.” These documents were submitted to the Bishops’ Council for consideration at its meeting in 2013. “We have considered all issues which were on the two-day agenda of the Inter-Council Presence’s plenary. This work began on an initiative of the Inter-Council Presence’s drafting commissions; church-wide discussion followed. The Editorial Commission summarized comments and opinions; the documents were thoroughly discussed at the plenary… We have drafted the documents of conciliar importance. God willing, our common work will serve to the unity of our Church and, most importantly, will help to save people,” the Primate of the Russian Church said in conclusion of the plenum. He thanked the Inter-Council Presence’s secretariat and all those who were working at the documents in the commissions.